Seniors are being targeted for scams at an alarming rate. While scam artists and fraudsters target people of all ages, races, religions and locations, older adults tend to be disproportionately targeted. Seniors are often targeted because they're viewed as having larger savings accounts, being more trusting, having impaired cognitive functioning, and being more isolated and less likely to report a scam. To help you and your loved ones stay on guard, we've assembled a list of some of the more common senior scams flagged by the U.S. Department of Justice, FBI, Federal Trade Commission, and various State Attorney Offices. We highly suggest you listen to the examples of the attempted frauds so you can familiarize yourself with their tactics. How do you know it's a scam? The IRS will never ask you to pay for back taxes by pre-paid card, credit card or wire transfer. The IRS will always contact you via mail first. If you want to know if you actually do owe back taxes to the IRS, call them directly at 1-800-428-1040. If you see a call coming from the IRS simply hang-up. Do not trust caller I.D., scammers often spoof caller ID to make their call look official. Medicare will never ask you to provide your social insurance number or financial information over the phone. Do NOT give out any personal information over the phone. Even if you believe the person on the other end of the line, simply hang-up and call Medicare directly from your own line at 1-800-MEDICARE. The lottery scam works by notifying you through mail, email or phone that you've won a prize. In one variation of the scam, in order to have your prize money wire transferred and deposited into your account, you're asked to provide your banking information. In another variation, in order to collect your check you're asked for money to cover shipping, processing, tax, insurance or some other fee. In all variations of the scams, the one thing they have in common, is that they either ask for money in order to collect your prize, or for your bank account information to have your prize money sent to. None of that will happen over the phone with a real lottery. Be especially careful of international lottery scams, as you will then have very little chance of recovering your money once it's left the country. Don't believe the hype. You will never be asked to send money in order to receive money. Secondly, no legitimate lottery will ask for your bank details over the phone. Just ask them to send you the check in the mail or for an address where you can pick up the check in person (hint: they will come up with a good excuse to avoid either scenario if illegitimate). 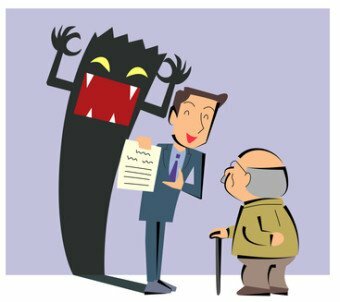 Living trust scammers will scare older adults in to buy a living trust, often costing over $2,000, by convincing them that if they don't, their savings and assets will be confiscated by the government or aggressive probate attorney's, leaving nothing for their families, when they die. Once the scammers get a clearer picture of your finances, they may also sell you expensive and unsuitable insurance and annuities. Although living trusts can have certain advantages over a will for some, the vast majority of older adults don't have enough financial assets to have to worry about their finances being held up in probate. Scammers will often make contact via door to door sales tactics, telemarketing, direct mail and invitations to free "seminars" or dinners, oftentimes calling themselves, "senior estate planners", "trust advisors", "paralegals" or "retirement specialists". The living trust was marketed at a "free seminar"
In this scam, computer users, are duped into buying tech support for a problem that doesn't exist. Here's how one recently busted scam worked. A user who forgot a password would do a Google search for a solution to help them find a forgotten password. They would click on an advertisement that brought them to a landing page where they would fill out an online form and then be contacted over the phone. The user would then give the phone agent remote access to their computer, and the agent would then show the caller false "evidence" of malware and viruses on their computer, whereupon they would offer their tech support services for several hundred dollars. Despite the panic, only call a trusted tech support firm. If you think your computer has a virus or malware, run an anti-virus program from a well-reputed name. Never call a number from a pop-up threat alert on your computer and always hang-up if someone calls you and says there's a virus on your computer. We all want to help where we can. Unfortunately, many fraudsters are praying on our better natures by pretending to be charities when they're actually not. How can you sniff out a fake charity? To avoid getting scammed by a fake charity, never donate over the phone if you were called unsolicited. Offer to look them up online and call them back. Visit their website and research the charity online (http://www.nasconet.org/resources/state-government/, https://www.irs.gov/charities-non-profits/tax-exempt-organization-search, https://www.charitynavigator.org/index.cfm?bay=content.view&cpid=1887) to make sure it's legitimate and a high proportion of your donation goes to the cause. Do not donate cash, donate by check, so there's a traceable record. In the grandparent scam, the fraudster will call, pretending to be a relative, or someone representing a relative (doctor, lawyer, police officer). The fake grandchild will act panic stricken, and say they are in dire trouble (car accident, arrested, etc...). They will also ask that you please don't call mom or dad, because they'll get really upset. Then they'll ask you to wire money to repair the car, pay or pay bail. Ask some personalized questions like, the name of their parents, siblings, nick names, what camp they went to, street they grew up on etc... If it all checks out (fraudsters can access very personal information via Facebook), offer to pay by credit card, that way if it is fraud, you're protected. Chances are if it's a scam they'll want you to wire the money or sometimes they ask for payment through gift cards. In the romance scam, you meet someone online, they shower you with praise and interest. Over time, you develop a deep connection with them. Then at some point, they ask you for money. The reasons can seem legitimate, like funds for a flight, bus, train or gas to come visit you, or money for a medical emergency. Scammers will find you on dating sites, facebook, Instagram and other social media. They'll often have very developed social profiles across multiple platforms to look legitimate. Don't be fooled. The FTC reports that romance scammers develop their trust over time and cost the average victim more than $2,600! Don't ever send money to anyone you haven't met in person. It's really that simple. If you detect any inconsistencies in their story, walk away. If they keep on making excuses as to why they can't meet you in person, cut off communication.